Illustration provided by the American Diabetes Association and David Priess. Your neck is one of the main places you tense up when you’re stressed. Stretch it out as shown to get more movement back. Stand with your feet apart and your knees slightly bent (or sit in a chair with your back straight and your feet on the floor). Relax your shoulders and bend your head toward your right shoulder. Hold it there for 5 seconds and then tilt it to the left for 5 seconds. Tip your head forward toward your chest. Hold this position for 5 seconds and then tilt your face toward the ceiling for 5 seconds. The upper shoulder is an area that most people lose flexibility in over time. Practice the stretch to keep or get some mobility back in that area. Stand with your feet a little apart. Slightly bend your knees and tense your stomach muscles. 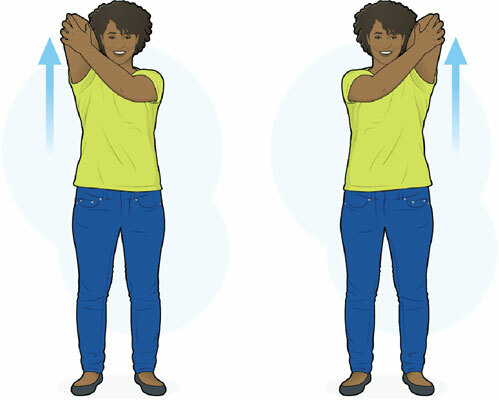 Relax your shoulders and pull your right arm across your chest by grabbing onto your elbow with your left hand; hold the stretch for 10 seconds. Repeat Step 3 with your left arm. 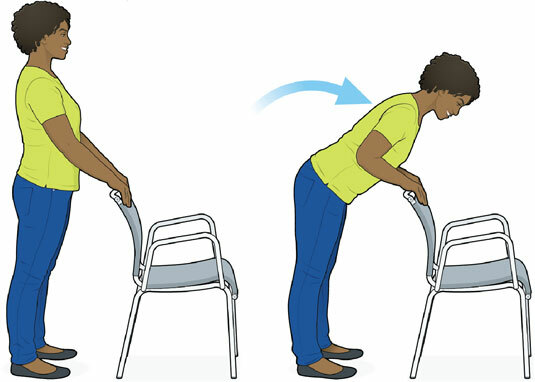 You can also do this exercise while seated in a chair. You can do this stretch standing or seated. 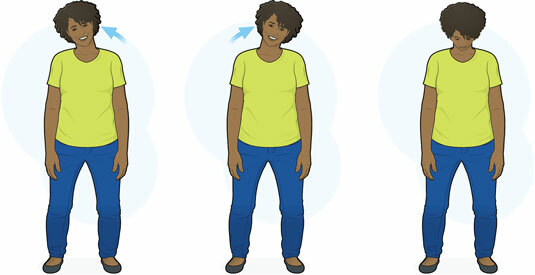 If standing, bend your knees slightly as shown in Figure 13-3; if seated, sit forward in your chair to fit your arms behind you. Tense your stomach and relax your shoulders. 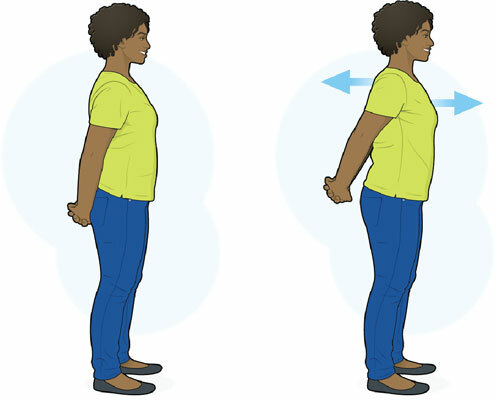 Try to clasp your hands behind your back, and then bring your shoulders back and push your chest forward. Hold the stretch for about 10 seconds. This stretch is another essential one to keep your shoulders flexible. It’s also a good move if you like to scratch your own back. Stand with your feet apart, your knees slightly bent, and your stomach tensed. 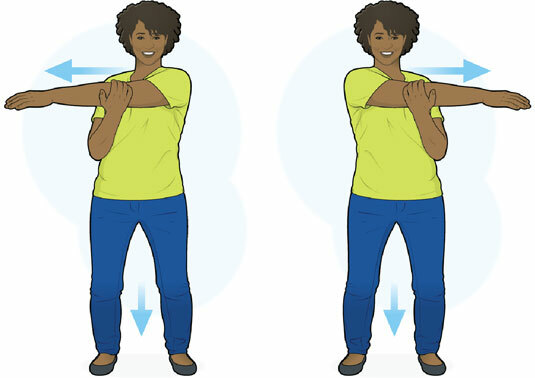 Relax your shoulders and bend your elbows while pulling your right arm straight up by pushing on the back of your right elbow with your left hand. 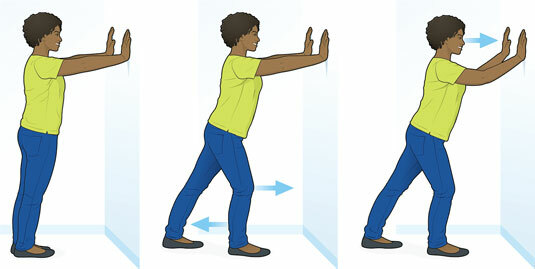 Repeat Steps 2 and 3 with your left and right arms reversed. Most people get some tightness in the backs of their thighs that can get worse over time. Work on reversing it with the stretch shown. Stand behind a chair with your legs straight, holding the back of the chair with both hands. Bend forward from your hips, not from your waist, keeping your back and shoulders straight. Your upper body will be over the floor. Hold this position for 10 seconds, relax, and repeat Step 2. Your calves are another area that can get too tight, especially if you ever wear shoes with heels. Work on getting your calves more flexible. With straight arms, put your hands on the wall in front of you. Move your right foot back from the wall about 12 inches while bending your left knee. Holding your back and your right knee straight, bend your elbows slightly; lean in a few inches toward the wall to stretch your right calf. Hold the stretch for about 10 seconds and then repeat Steps 3 and 4 with the other leg, again holding for 10 seconds.